A formal diagnosis won't be established until Cousins undergoes an MRI on Tuesday, but a torn tendon would likely require surgery and sideline him for the remainder of the playoffs. 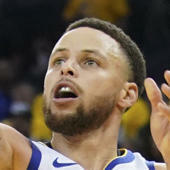 The Warriors are holding out hope that Cousins is merely dealing with a strained quad, but all indications are that the big man's injury was of the non-contact variety, which would hint at a more severe setback. After missing nearly a full year of action while rehabbing a torn left Achilles' tendon, Cousins had started to round back into form late in the regular season, but the new lower-body injury could force him to settle for another short-term deal when he hits free agency this summer. As for Golden State's plan moving forward in the event Cousins is indeed out, the team will likely turn to Andrew Bogut and Kevon Looney to cover most of the minutes at center.